Intellectual Property Theft. TOC networks are engaged in the theft of critical U.S. intellectual property, including through intrusions into corporate and proprietary computer networks. Theft of intellectual property ranges from movies, music, and video games to imitations of popular and trusted brand names, to proprietary designs of high-tech devices and manufacturing processes. This intellectual property theft causes significant business losses, erodes U.S. competitiveness in the world marketplace, and in many cases threatens public health and safety. Between FY 2003 and FY 2010, the yearly domestic value of customs seizures at U.S. port and mail facilities related to intellectual property right (IPR) violations leaped from $94 million to $188 million. Products originating in China accounted for 66% of these IPR seizures in FY 2010. Cybercrime. TOC networks are increasingly involved in cybercrime, which costs consumers billions of dollars annually, threatens sensitive corporate and government computer networks, and undermines worldwide confidence in the international financial system. Through cybercrime, transnational criminal organizations pose a significant threat to financial and trust systems—banking, stock markets, e-currency, and value and credit card services—on which the world economy depends. For example, some estimates indicate that online frauds perpetrated by Central European cybercrime networks have defrauded U.S. citizens or entities of approximately $1 billion in a single year. According to the U.S. Secret Service, which investigates cybercrimes through its 31 Electronic Crimes Task Forces, financial crimes facilitated by anonymous online criminal fora result in billions of dollars in losses to the Nation’s financial infrastructure. The National Cyber Investigative Joint Task Force, led by the Federal Bureau of Investigation (FBI), functions as a domestic focal point for 18 federal departments or agencies to coordinate, integrate, and share information related to cyber threat investigations, as well as make the Internet safer by pursuing terrorists, spies, and criminals who seek to exploit U.S. systems. Pervasive criminal activity in cyberspace not only directly affects its victims, but can imperil citizens’ and businesses’ faith in these digital systems, which are critical to our society and economy. Computers and the Internet play a role in most transnational crimes today, either as the target or the weapon used in the crime. The use of the Internet, personal computers, and mobile devices all create a trail of digital evidence. Often the proper investigation of this evidence trail requires highly trained personnel. Crimes can occur more quickly, but investigations proceed more slowly due to the critical shortage of investigators with the knowledge and expertise to analyze ever increasing amounts of potential digital evidence. Sustainable progress against TOC requires both political commitment and effective law enforcement and criminal justice capacities on a worldwide basis. TOC threatens the security and well-being of people around the world and jeopardizes the functioning of the global economy. Not all of these threats are equally visible to international audiences. Absent broad recognition of these shared threats, our collaboration with international partners to confront TOC will be constrained by limited political will. The United States will reach out directly to the international business community and the general public to convey that both nations and individuals share a common enemy in TOC and have a common stake in addressing this threat. For nations that have the will to fulfill their international law enforcement commitments but lack the necessary means, the United States is committed to partnering with them to develop stronger law enforcement and criminal justice institutions necessary for ensuring the rule of law. Over the past decade, important gains have been made in developing criminal justice capacities in key regions of the world. The goal of the United States is to promote the expansion of such achievements on a worldwide basis, to the point where international law enforcement capabilities and cooperation among states are self-sustaining. Great progress also has been made in developing a common normative framework for international cooperation against TOC threats. The challenge for the United States and other countries over the next decade is to bring the promise of this worldwide regime into practice. The United States will encourage international partners to dedicate the necessary political capital and resources toward making the promise of these commitments a reality. The United States will pursue this through both a renewed commitment to multilateral diplomacy and by leveraging bilateral partnerships to elevate the importance of combating TOC as a key priority of U.S. diplomacy. 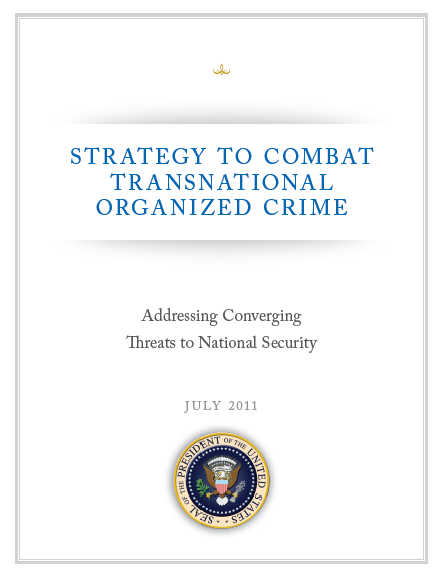 For example, in February 2011, the United States and the United Kingdom established the Organized Crime Contact Group, to be chaired by the UK Home Secretary and the Assistant to the President for Homeland Security and Counterterrorism. In addition, the United States deploys hundreds of law enforcement attachés to its missions abroad to develop and maintain foreign contacts essential to combating immediate threats to public safety and security. The United States will continue to place a high priority on the provision of international technical assistance through our missions abroad and will continue to improve the coordination of these programs.